Southern Solutions is a technology company in Southern Maryland providing network solutions and IT services. Through our Managed Network Services, we are currently managing many customers’ networks in Southern Maryland. We specialize in monitoring & proactive support services and provide remote & onsite IT support for servers, computers and other network related issues. We work with a wide variety of establishments including small businesses, religious organizations and non-profits. 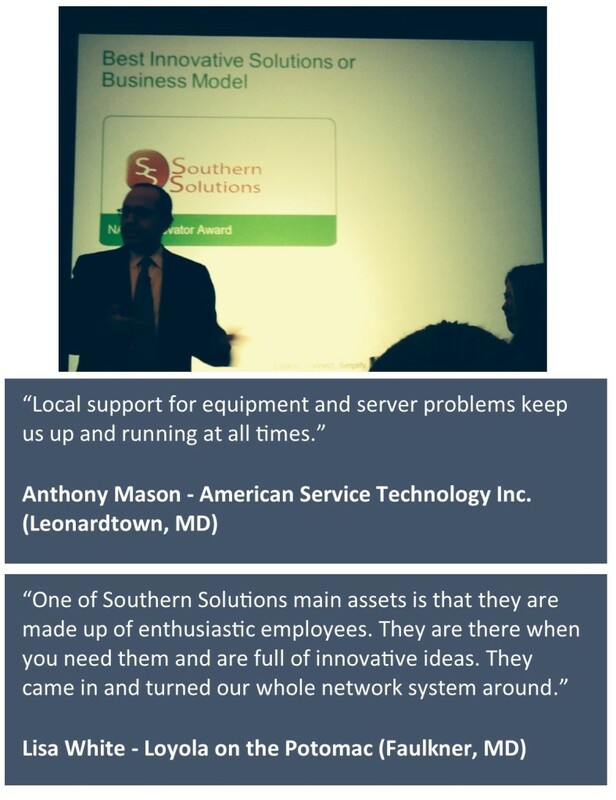 Southern Solutions was formed in 2006 and began offering network & IT solutions because we saw a need for responsive, customer service focused network support for companies in Southern Maryland. Adding network services to our portfolio of offerings seemed like a natural fit for our business. Earlier this year, we won an award from Xerox for the Best Innovative Business Model. We hope you will consider our network & IT solutions and let us ensure your network is always running smoothly. For more information and video overviews of our services, click here. Please contact us at anytime to discuss our IT solutions.